Is Black or White a Color? Today’s topic of whether black or white is a color was chosen by Rebecca T at UT Austin. Samie L at University of King’s College, Halifax, NS suggested the topic of color as well. So today’s post will be a colorful one. I initially approached Rebecca’s question in the scientific way. Namely, the first thing to ask is: What is color? Color is just a visually–perceived difference between electromagnetic waves of different frequencies. 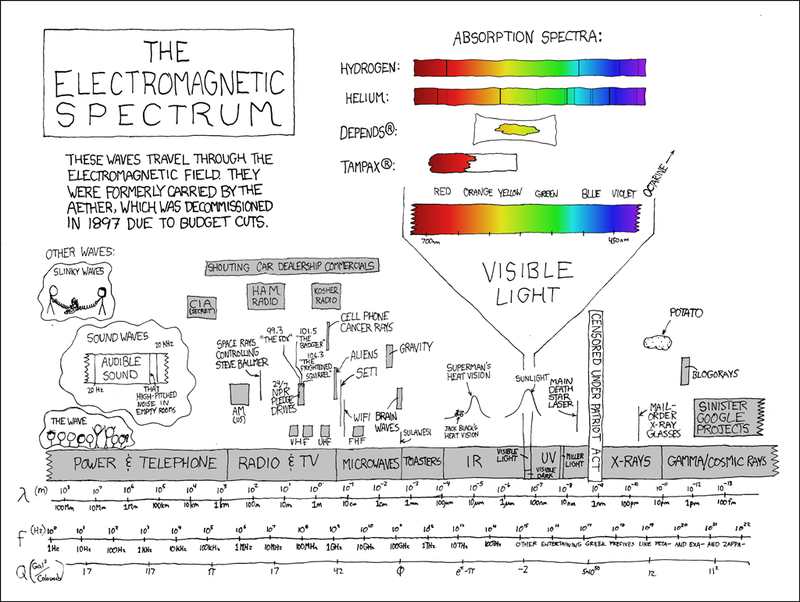 White is the sum of all of the visible wavelengths. When a prism turns white light into a spectrum, it is merely separating the different frequencies of light. That’s how rainbows work, only they replace prisms with raindrops. But is white actually a color? White is not defined by any particular frequency of light, so if every color must correspond to a frequency, then it is not one. Neither is black. Black is the absence of light. And the absence of light can’t have a frequency. So according to physics, it seems the answer is no. The question itself, however, seems useless if we are just looking at the physics of light. It is more appropriate to look at color from another viewpoint. In computer science, colors are usually defined as the sum of red, green, and blue values. Anyone who has tried to code a website is probably familiar with the hexadecimal color system, in which red is #ff0000, green is #00ff00, and blue is #0000ff. In this system, white and black are also colors, given by the codes #ffffff and #000000 respectively. So it seems to depend on our use of color. I’m not a physicist; I’m a student and a blogger. For all practical purposes, I consider black and white to be colors. What are your thoughts?